Tena Durrani Summer Wedding Formal Collection are traditional dresses that can be worn during this hot summer season on special occasions and festive events. Tena Durrani is a huge name in Pakistani fashion industry her collections are based on casuals, semi-formals and formal dresses her major work is for the bridal dress industry.She has launched many different types of bridal formal wear and wedding day dresses in both luxury modern and traditional designs. This summer we are seeing a trend of bridal formal dresses because some new brides have been married recently who will like to wear formal dresses that are designed in a bridal way.Although there are some formal collections but bridal formal dresses are different they suit brides more than any other formal dress. Because as a new bride you want to carry the charm of the bride and want to still look like a new bride that got married recently that’s why bridal formal dresses are designed with jeweled work and some of the dress categories are related to the brides. Today we have got Teena Durrani formal collection for the brides that got married recently these dresses are for the special occasions and festive events that are around the corner.First, it will be Ramadan Aftaar parties and then it will be Eid so there are at least two-three months where you want to look great and these dresses will help you in achieving that bridal look. 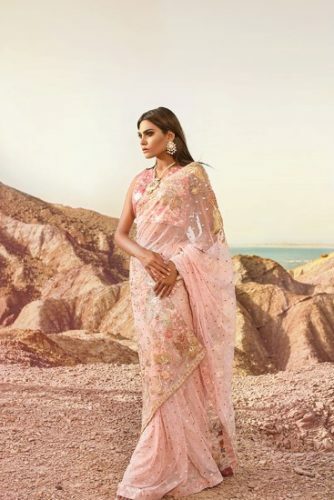 This collection is based on traditional luxury designs all the dresses included are bridal dresses like lehengas and sarees, tops and trousers are also available.So basically this is a multipurpose collection for the new brides where they want to look like they were on their wedding day. 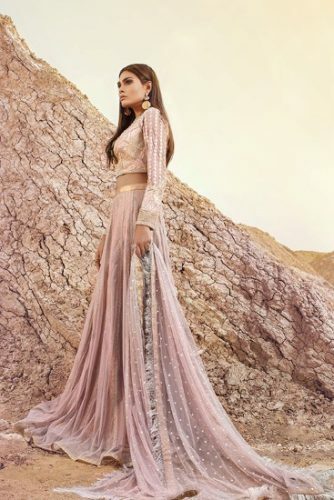 Well, it will not exactly the same as bridal day dresses but have the exact same type of designs that will give you a bridal feeling.Teena Duraani has recently launched a lot of formal designs but most of her work is seen around the fall season because winter is the wedding season in Pakistan. 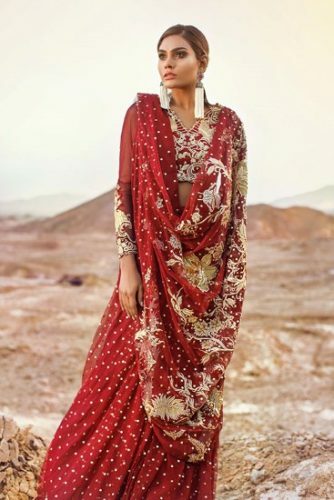 Colors of this collection are lighter including red shades but have crimson color in most part of the dress as you can see from the image gallery.Shimmers and jeweled work are included because the traditional bridal dress is incomplete without those materials. 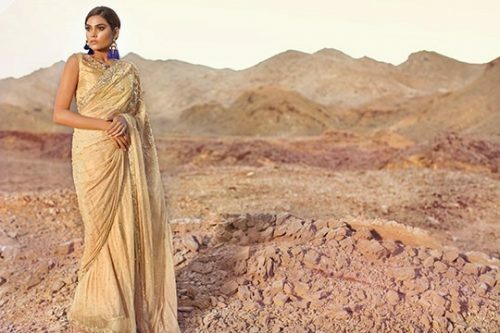 All the designs launched in Tena Durrani Summer Wedding Formal Collection is a work of art that can only be done by expert wedding dress designer.Like you have previously seen her work in Teena Durrani Luxury Bridal Traditional Dresses this collection will also take your breath away. If you are looking to shop one of Teena Durrani bridal collections then log on to the official web of the designer and select your designs from the site.So let’s see the complete gallery of bridal dresses that are launched in this beautiful collection.